Biotech 2019 gathering will showcase the Latest Horizons in Biotechnology and CRISPR Advances, which will give a worldwide stage to talk of present and future of biotechnology. This Biotechnology Conference 2019, brings together the pioneers doing the most innovative work within the industry and across the globe. Among all International Biotechnology 2019 conferences, in this meeting, you will experience unique research outcomes on Advanced Biotechnology, Industrial Biotechnology, Medical Biotechnology and CRISPR Based Technologies . 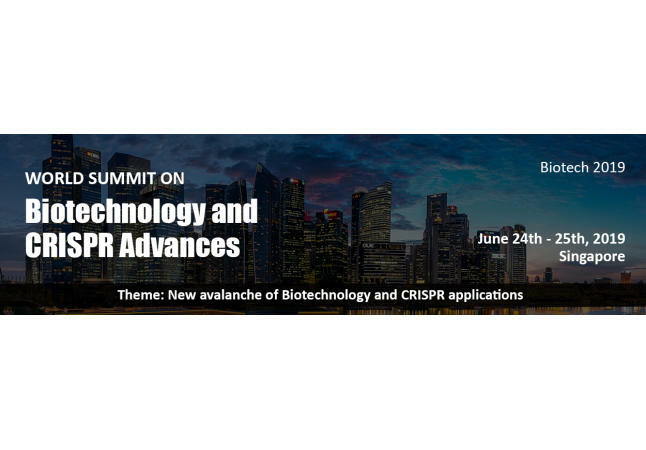 This Biotechnology and CRISPR Advances summit 2019 will be with International keynote speakers, Industry speakers, panel discussions and more. Speakers are invited from USA, Europe, and Asia Biotechnology & CRISPR industries, to share their unique insights with us. In this summit discussions will be on Protein Engineering, Nano-Biotechnology, Forensic Biotechnology, and CRISPR in 3D culture, Stem Cell technology, CRISPR Based Technologies, and Bio-products. The Biotech 2019 welcomes 100 future biotech leaders (Leaders of Tomorrow) from around the world. In addition, the Biotech 2019 also attracts world leaders from the CRISPR and Biotech industry, who will engage, challenge and inspire the youthful explorers. The Biotech 2019 is held in Singapore at the Holiday Inn Atrium, Singapore. The Biotech 2019 is a 2-day conference, which will provide the bio-leaders of tomorrow with a comprehensive overview of current and future biotechnology trends and issues, inciting discussion about world challenges that can be met by CRISPR- Cas 9 applications. The next generation will also be challenged to take up leadership by proposing and developing real-life impactful solutions as part of the Voices of Tomorrow business plan competition.